Marcus Mariota started off slow, but got hot in the 3rd quarter to lead his team past Michigan State. On Saturday night, the Michigan State Spartans made a rare visit to Eugene, Oregon to face the Oregon Ducks. This was a highly anticipated matchup between a Spartan team that will smack you in the face vs an Oregon team that is viewed as a speedy, finesse team. In the past, physical teams have been an issue for the Ducks. I thought going into the game, that the Spartans had an excellent chance to go in and steal one from Oregon. For 2 ½ quarters, it looked like Michigan State might do just that. Oregon scored the first 11 points of the game and it looked like the Spartans might be in trouble, but Michigan State recovered and scored 17 straight points before the half to take a 24-18 lead into halftime. The Spartans picked up another field goal early in the 3rd quarter to extend their lead to 27-18, but then Oregon quarterback Marcus Mariota got hot and changed the momentum of the game. He hit Keanon Lowe for a 37 yard TD and the Ducks scored 14 points in a 5:00 span to end the 3rd quarter with a 32-27 lead. Once Mariota got the offense going, the entire team started playing better and the Ducks scored the last 28 points to win 46-27. 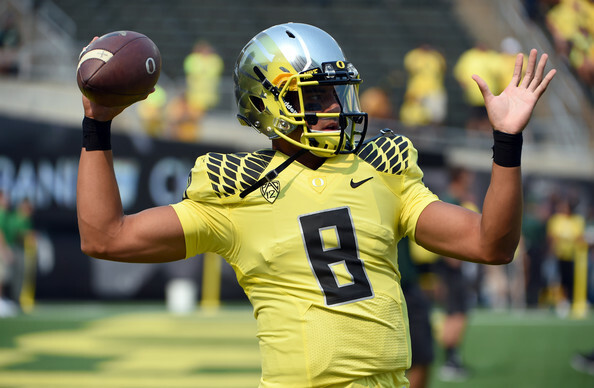 Marcus Mariota, QB, Jr: Heisman Trophy front runner. Very fast and athletic. True dual threat. Constantly attacks defenses. Makes people miss in space and extends plays with his legs. Will improvise when plays break down. Came alive in the 3rd quarter to rally his team to an easy come from behind win. Completed 17 of 28 for 318 yards and 3 touchdowns. Carried the ball 9 times for 42 yards and had a 40 yard run. Byron Marshall, RB, Jr: Versatile player that can also contribute in the passing offense. Able to split out wide. May be a better receiver than runner. Carried 5 times for 9 yards. Caught 3 passes for 36 yards and had a 22 yard catch. Keanon Lowe, WR, Sr: Lines up all over, including in the backfield. Able to go across the middle, take hits and hang on the ball. Had a 37 yard touchdown that changed the momentum and put his team in the lead for good. Very good blocker. Had 3 catches for 58 yards and a TD. Arik Armstead, DT/DE, Jr: Versatile player that can line up all over and is even able to drop into coverage. Lines up inside and outside. Separates quickly from blockers. Great combination of size and athleticism. Pursues down the line of scrimmage. Had 5 tackles, 2 tackles for loss, 1 sack and 1 QB hurry. DeForest Buckner, DE, Jr: Great size (6’7” and 290 lbs). Versatile player that can contribute in a lot of ways. Plays the run and pass well. Had 7 tackles, 1 tackle for loss, 1 QB hurry and caught a pass for a 2 point conversion. Christian French, OLB, Jr: Able to play upright or with his hand in the dirt. Had 1 tackle, 1 tackle for loss and a sack. Tyson Coleman, OLB, Jr: Athletic and instinctive. Gets his hands up on pass rush. Had 4 tackles, 1 QB hurry and 1 batted ball. Joe Walker, ILB, Jr: Always around the ball. Plays downhill and plugs holes well. Had 9 tackles and 2 tackles for loss. Derrick Malone, ILB, Sr: Three-down linebacker that drops well into coverage. Had 5 tackles and 1 pass breakup. Ifo Ekpre-Olomu, CB, Sr: One of the best corners in the draft this year. Plays tight coverage and has very good ball skills. Gets even tougher in the red zone where he gets most of his picks. Made an amazing diving interception in the red zone off a tipped ball. Able to return punts and had a 30 yard punt return brought back by penalty. Had 5 tackles and 1 pick. Troy Hill, CB, Sr: Very physical. Closes quickly on the ball. Wraps up well. Does a good job using his off hand to bat the ball away. Able to return kicks. Had 9 tackles, 1 tackle for loss and 1 pass breakup. Dior Mathis, CB, Sr: Comes up quickly in run support. Good form tackler. Had 3 tackles. Erick Dargan, FS, Sr: Pursues well. Dangerous with the ball in his hands. Had 3 tackles, ½ tackle for loss and an interception that he returned 36 yards. Connor Cook, QB, Jr: Started his career strictly as a game manager, but has grown way past that. MVP of both the Big Ten Conference Championship Game and the Rose Bowl. Seems to grow in confidence with every start. Had 11 straight wins before this game. Able to drop the ball into small openings. Uses his legs to extend plays. Does a good job reading the defense and following his progressions. Very good on play action and bootlegs. Has good zip on the ball. When under pressure, he does a good job keeping his eyes downfield. Completed 29 of 47 for 343 yards, 2 TD and 2 INT. Was forced to throw the ball late in the game when his team was behind. Jeremy Langford, RB, Sr: Big and powerful. Good footwork and vision. Always moving forward and rarely has a run for negative yardage. Does a good job finding creases. Had 86 yards rushing on 24 carries and 1 TD. Tony Lippett, WR, Sr: The go-to receiver in this offense. Able to line up outside or in the slot. Does a good job catching with his hands. Physical. Tough to cover one on one. Game breaker. Drives off defenders and gets good separation. Had a 34 yard catch before the half that set up a touchdown. Led the team with 11 receptions for 133 yards and 1 TD. Macgarrett Kings Jr., WR, Jr: Very good footwork. Needs some work on field awareness. Able to return punts. Had 2 catches for 20 yards. One of his catches came up short of the sticks on 3rd down. Josiah Price, TE, RS Soph: Improving as a blocker. Soft hands. Breaks tackles after the catch. Runs nice routes. Had 5 catches for 51 yards and scored a TD just before the half. Marcus Rush, DE, Jr: Very active. Gets upfield and creates havoc. Good motor and doesn’t give up on plays. Usually does a good job playing containment, but bit inside on the Mariota 40 yard run. Had 11 tackles, 2.5 tackles for loss and 1 sack. Shilique Calhoun, DE, Jr: Great body type. Height/weight/speed specimen. Plays very disciplined. Had a quiet day with 4 tackles. Injured his wrist, but returned. Lawrence Thomas, NT, Jr: Tough to run against. Had 2 tackles, 1 tackle for loss and 1 sack. Had a nice tackle short of the first down in the red zone. Riley Bullough, OLB, RS Soph: Brother of Houston Texans linebacker Max Bullough. Runs and pursues well. Wraps up well. Had 2 tackles. Trae Waynes, CB, Jr: The next in a line of tough man cover corners for the Spartans. Had a quiet day. Had 4 tackles and 1 pass breakup. RJ Williamson, SS, Jr: Big hitter. Flies to the ball. Gets off blocks quickly. Had 9 tackles. Come back next Wednesday as I discuss another of the big games from this weekend. If you like what you read, like us on Facebook and tell your friends. See you next Wednesday! This entry was posted on September 10, 2014 by draftmaniacs in Uncategorized and tagged 2015 NFL draft, Arik Armstead, Byron Marshall, Christian French, Connor Cook, DeForest Buckner, Derrick Malone, Dior Mathis, Erick Dargan, Heisman Trophy, Ifo Ekpre-Olomu, Jeremy Langford, Joe Walker, Josiah Price, Keanon Lowe, Lawrence Thomas, Macgarrett Kings Jr, Marcus Mariota, Marcus Rush, Max Bullough, Michigan State football, NFL, NFL Draft, Oregon Ducks, Riley Bullough, RJ Williamson, Shilique Calhoun, Tony Lippett, Trae Waynes, Troy Hill, Tyson Coleman.